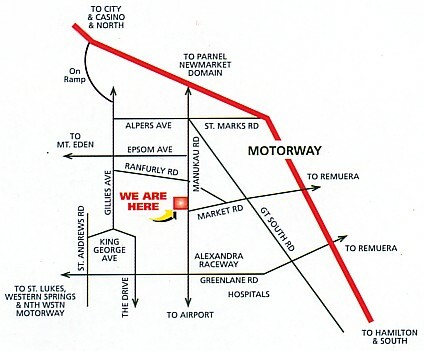 All City bound buses pass our gate and bring you back via the Mecca of shopping – Newmarket – and stop to let you out right outside Ranfurly Motel. FROM THE SOUTH: take the Market Rd off ramp, turn left into Market Rd, right into Ranfurly Rd and left into Manukau Rd. Ranfurly Motel is 50 metres along on the right. FROM THE NORTH: take the Gillies Ave off ramp, turn right into Gillies Ave, left into Ranfurly Rd and right into Manukau Rd. Ranfurly Motel is 50 metres along on the right.